Amada 1st released their Punch machines as THIN TURRET PUNCHING MACHINES. The machine turret was same as Strippit Fab tooling for 1-1/4” station, but for 3-1/2” they choice a different ID bore size, making, keying and designed the die to be thicker. 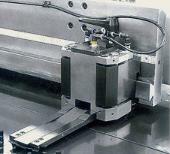 Then Amada designed and released there THICK TURRET style machine.